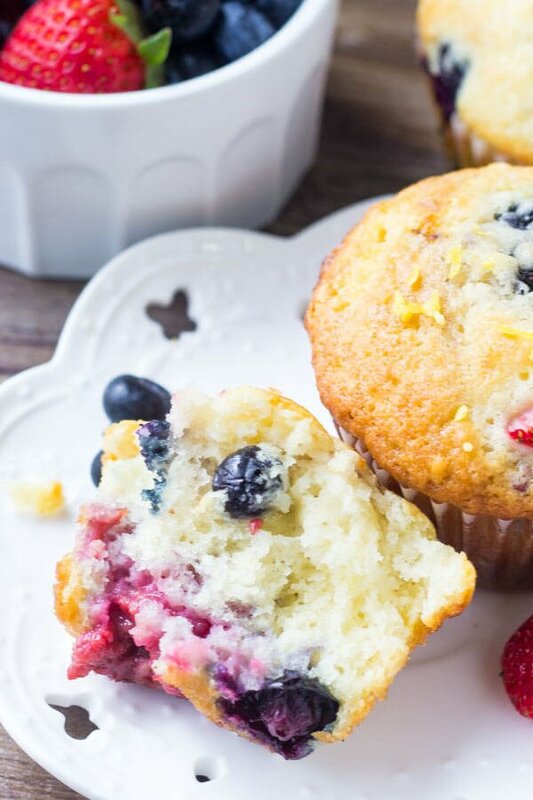 These triple berry muffins are bursting with fresh fruit. 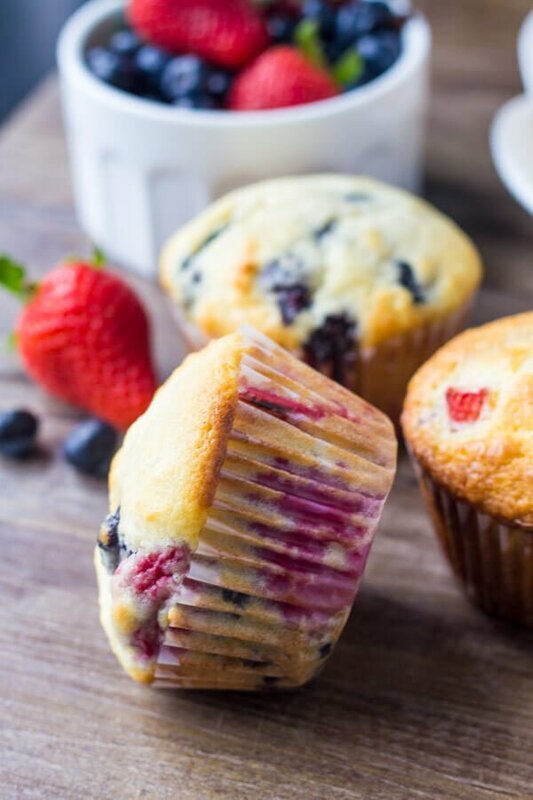 Fluffy, buttery, super moist & oh so soft – make them with fresh or frozen fruit for the perfect mixed berry muffin. 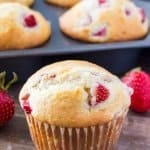 I originally made these triple berry muffins and shared the recipe almost 2 years ago. 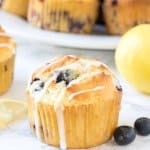 They have the perfect texture that’s fluffy, buttery, and perfectly moist – so I decided to update the recipe and share even more tricks for the perfect mixed berry muffins. Either way, muffins are a fantastic way to kick off your Saturday morning. And these moist triple berry muffins are the perfect muffin recipe. 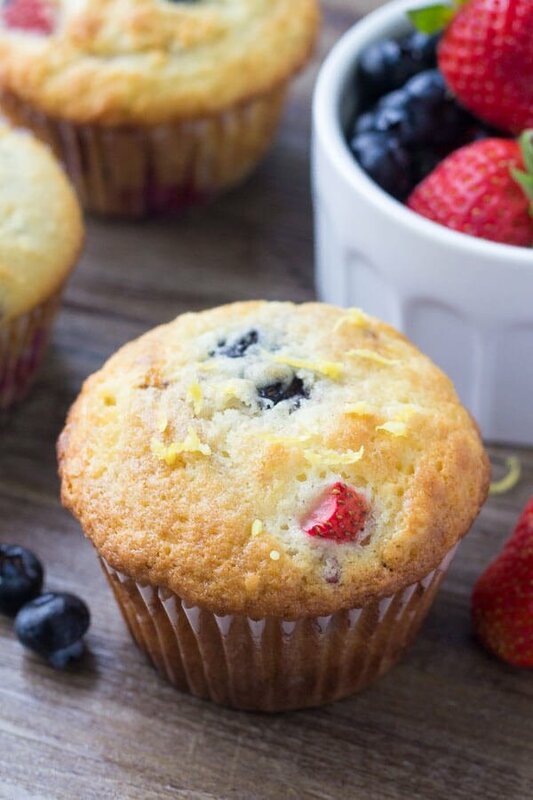 Big, buttery, fluffy muffins filled with fresh fruit. 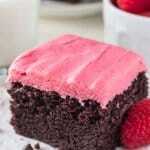 Super moist without being greasy. Soft on the inside and slightly crisp on the edges. These triple berry muffins are my favorite… even if there’s no chocolate. 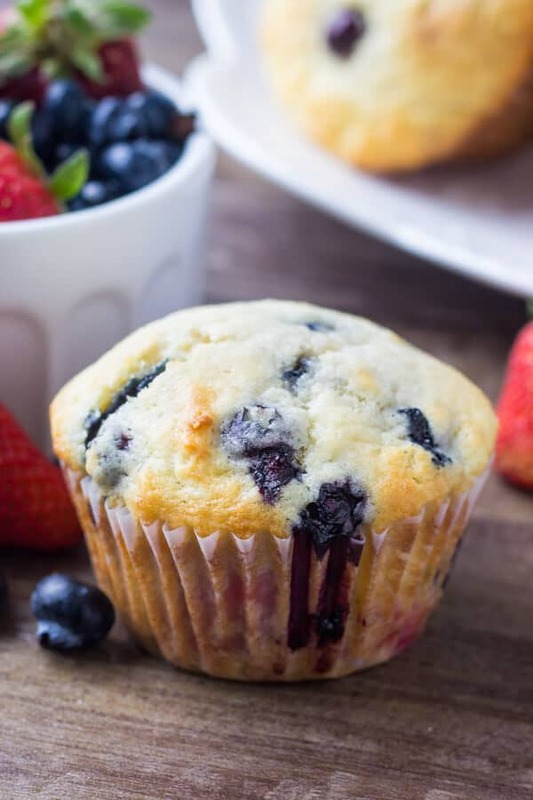 For these triple berry muffins I typically use blueberries, strawberries & raspberries. But feel free to use your favorite combination. 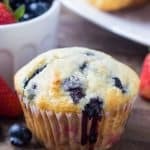 You can make these mixed berry muffins with frozen berries too – just make sure not to dethaw the berries first. Then we’re adding a in little lemon zest which helps to brighten up the flavor. SO… Now for some muffin advice. Start with all your ingredients at room temperature. This makes it way easier to combine your ingredients. Buttermilk! Buttermilk makes muffins soft, moist & fluffy. If you don’t have any on hand, you can make your own with vinegar and cow’s milk (see the notes in the recipe). I’d definitely recommend using whole milk or 2% though to give your muffins more flavor. Then sour cream adds moisture and fluffiness in the best possible way. Use a large rubber spatula or wooden spoon to mix your dry ingredients into the wet. You don’t need to mix til the batter is smooth – a few lumps are OK. If you mix too much, your muffins can get tough. Fill your muffin cavities to the very top – about 1/3 cup batter per muffin. This helps you to get that classic muffin shape. The batter is nice & thick, so you don’t need to worry about it over flowing. Bake your muffins for the first 5 minutes at 425F degrees, then turn down your oven to 375F and continue baking. The high initial heat makes your muffins rise lots, and gives just the right level of goldenness on the top. Everyone loves these moist triple berry because they’re so fluffy and bursting with berries. Choose your favorite berry combination – or even add a few chocolate chips – and you’ve got yourself the most perfect breakfast! These triple berry muffins are bursting with fresh fruit. Fluffy, buttery, super moist & oh so soft - these are the perfect summertime breakfast! Preheat the oven to 425F degrees. Line with muffin papers or butter and flour two 12-cavity muffin pans. I ended up with 15 muffins total. In a large bowl beat the butter and sugar until light and fluffy. Add in the eggs and vanilla and continue beating until combined. Turn off the mixer. Fold in the lemon zest, sour cream and milk using a large rubber spatula or wooden spoon. In a separate medium sized bowl, whisk together the flour, baking powder & salt. Gently fold the dry ingredients into the wet until almost combined. The batter will be very thick. 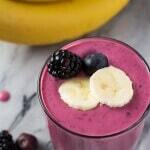 If using frozen berries - toss the berries with 1 tablespoon of flour. 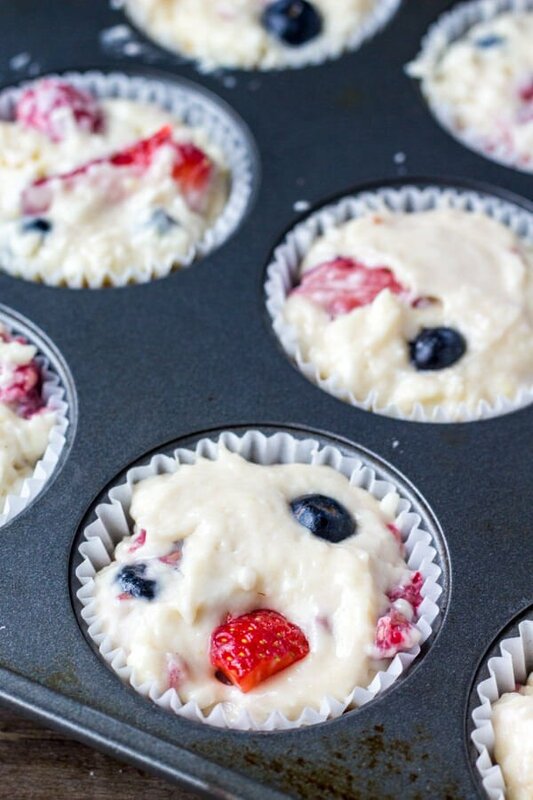 Then gently fold the berries into the muffin batter. Fill muffin cavities to the top (about 1/3 cup batter). Bake at 425F for 5 minutes then turn down the oven to 375F and continue baking for 10-13 minutes. The tops should be just starting to brown and an inserted toothpick should come out clean. Let muffins cool in the pan for 5-10 minutes. Then remove and continue cooling on a wire rack. *Or add 2 teaspoons of vinegar to 3/4 cup milk. These muffins are amazing! I added cinnamon strusel to the top (recipe under blueberry muffins). 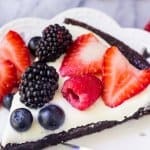 Perfectly moist and loaded with berries! You could use yogurt instead – I recommend full-fat, plain Greek yogurt. If you don’t have yogurt either, you could substitute with buttermilk. Omg I just made these they are so delicious!!!! Thank you for the recipe!